India defeated Australia by 48 runs in their final pool game of the ICC Women's World T20 at Providence Stadium in Guyana and topped Group B. It was a great performance by the Women in Blue who posted a competitive total and then defended the target with ease. Indian captain Harmanpreet Kaur won the toss and decided to bat first. It was a poor start by India losing an early wicket of Taniya Bhatia for just 2 runs. 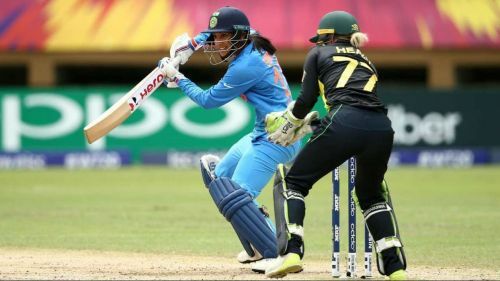 The stylish left handed batter Smriti Mandhana played with positive intent putting pressure on Australian bowlers. At the end of 6 overs, India scored 46 for 1. After the power play overs, Jemimah Rodrigues was dismissed for 6 runs. Mandhana and Harmanpreet Kaur attacked the Australian bowling line up with their aggressive hitting. The left-hander reached her half century off 31 balls while the skipper made batting look easy with big hits. Mandhana and Kaur added 68 runs for the 3rd wicket. Kaur was dismissed for 43 off 27 balls with 3 fours and 3 sixes. After the wicket of Kaur, India kept losing wickets at regular intervals while Mandhana hit big shots. The left handed batter Mandhana was dismissed for 83 off 55 balls. India posted a competitive total of 167 for 8. For Australia, Perry took 3 for 16 and Gardner 2 for 25. Due to concussion, their regular opener Alyssa Healy did not come to bat. Villani and Beth Mooney got the team off to a decent start adding 27 runs for the opening wicket. Deepti Sharma struck dismissing Villani and Mooney in successive balls. At end of six overs, Australia scored 39 for 2. After the power play overs, the Indian spinners choked the Australian batters. Haynes and Perry added 31 runs for the 5th wicket before Indian bowlers continued to take wickets. Perry provided the only resistance who remained not out on 39. India bowled out Australia for 119 in 19.4 overs. For India, Anuja Patil took 3 for 15, Deepti Sharma, Radha Yadav and Poonam Yadav all took 2 wickets each. With this win, India top Pool B and will face the loser of the England versus West Indies match in the semi-finals to be played on 23rd November.